The Federated Academic Community (Comunidade Acadêmica Federada - CAFe) is an identity management system that gathers Brazilian education and research institutions, through their databases integration. This means that the user can access the services of their institution and the ones offered by other participating organizations from wherever they are, through a single sign-on account. This authentication eliminates the need for multiple access passwords and registration processes, generating a trusting relationship. Distance learning services, access to scientific publications and collaborative activities are among the biggest beneficiaries of the infrastructure offered by federations. Institutions belonging to CAFe may act as identity providers (IdP) and as service providers (SP). RNP is responsible for managing and keeping the centralized repository with data on federation members. For the service provider, the register used can be managed by other institutions (identity providers), with the guarantee of information reliability and updating. They undertake explicitly to maintain the information provided updated, contrary to what happens with solutions in replicated registers. In addition to serving a growing number of Brazilian educational and research institutions, CAFe is part of many international initiatives, which increases the range of services available to its members. Since December 2012, it is part of eduGAIN, a service that gathers identity management federations that are partners of GÉANT (Pan-European Research Network / Rede de Pesquisa Pan-Europeia). This organization is manager of a high capacity network that includes more than three thousand educational and research institutions in 32 countries through 28 national and regional networks of education and research. CAFe was the first federation in the Americas to be part of this network. Besides Brazil, Germany, Austria, Belgium, Canada, Chile, Croatia, Denmark, Finland, France, Greece, Holland, Hungary, Ireland, Italy, Latvia, Norway, Poland, Slovenia, Spain, Sweden, Switzerland, United Kingdom and Czech Republic are also part of the federations. Since March 2011, CAFe is part of the map of the global education and research identity federation kept by the Research and Education Federations (REFEDS), where its participants share the interest in developing technologies, policies and identity management processes. Thus, the federation became the first in Latin America to be internationally recognized for this initiative, managed by the Trans-European Research and Education Networking (TERENA), which articulates the needs of identity federations for education and research worldwide. Brazil has a leadership position in relation to identity federations in the project Europe Latin America Collaborative e-Infrastucture for Research Activities (ELCIRA) project, managed by the Latin American Advanced Networks Cooperation (RedCLARA) with funding from the European Community. The goal is to support the execution of collaborative projects between researchers from Latin America and Europe. A federated authentication and authorization infrastructure is consisted of two main elements: the identity providers, responsible for maintaining information about users and their authentication; and service providers, which offer access to a specific feature or service. The interaction between both is a relationship of trust, because one needs to believe in the quality of data provided by the other, to ensure that these are only used for the agreed purposes. When accessing a certain service provider, the user is redirected to a page that presents a list of identity providers. The user then choose his home institution and the browser is redirected to this institution’s identity provider. After the user is authenticated, the identity provider sends this authentication result to the service provider and creates a session associated to the user, so that accesses to new services within a given time interval do not generate new authentication requests. Signing the Term of Commitment. The Advisory Committee evaluates the formal appointment of the new service provided. The service is included to the CAFe, published on the federation’s page and communicated to the representatives of client institutions. RNP Digital Video portal brings three different services (Video on Demand, Live Video Transmission and TV Signal Transmission) and integrates to the content of the Videoclass@RNP service. The Video on Demand aims to be a video repository with content related to the activities of the purposes of RNP user organizations (science, technology, education, health and culture) and the federated access to it allows the user to comment on existing videos and publish new videos. The publication, however, still requires RNP’s prior authorization obtained after the request is made ​​through the Service Desk (sd@rnp.br). A division of Newsbank content portal, the Readex provides access to an archive of historical newspapers, containing publications from Africa, Latin America, Southeast Asia and Caribbean, 19th century to the early 20th century. Federated access must be performed via the Newsbank portal. The Periodical Portal of the Coordination of University Level Personnel Improvement (Coordenação de Aperfeiçoamento de Pessoal de Nível Superior - CAPES) is a virtual library, which gathers and makes available the best in international scientific productions to educational and research institutions in Brazil. It has a collection of more than 30.000 titles, 130 referential bases, ten bases dedicated exclusively to patents, as well as books, encyclopedias, reference books, technical standards, statistics and audiovisual content. Type of access: available to participating institutions in the CAPES Periodical Portal. DreamSpark is a Microsoft program that offers software, free to download, for university level students. This program is already offered in many countries through academic federations such as CAFe. Type of access: free for CAFe members. There is also the option of joining a premium account with more features and more software available for download. The registration fee and the requirements for membership are defined by Microsoft. The Journal and Event Management System (JEMS) is a system for articles’ submission, review, discussion and selection for scientific events of the Brazilian Computer Society (Sociedade Brasileira de Computação - SBC), maintained by the Federal University of Rio Grande do Sul (Universidade Federal do Rio Grande do Sul - UFRGS). Its main goal is to make available an infrastructure for academic participants in SBC events to submitting articles and summaries for evaluation. Thus, the analysis of such documents by the event’s organization and the decision of which of them will be selected for participation is made possible. Collaborative environments for academy, industry and general public, promoting discoveries and innovation. Communities: the service allows group work management and present tools that ease the information exchange, the knowledge constitution and ideas discussion. Wiki: the Wiki service facilitates the collaborative creation through web tools. Support: complementary, specialized and virtual resource offered by RedCLARA to every user of its services. Its goal is to answer doubts and incidents related to the material, to the information and to the services provided. Filesender: large file transfer service that allows to load large quantities of information temporarily to a RedCLARA server, that sends a web address; through it, any person or group may download the content sent as many times as needed during a week. Web Conference: with VC Espresso, it is possible to make voice and/or video conferences in a personal computer with any registered user on RedCLARA’s portal. Besides, it is possible to invite non-registered persons. The PADBR computational grid offers integrated access to the high performance resources geographically distributed among the High Performance Processing National Centers (Centros Nacionais de Processamento de Alto Desempenho - CENAPADs). There are nine units, respectively operated by UFRGS, UFMG, UFC, UNICAMP, UFRJ, UFPE, INPE, INPA e LNCC. 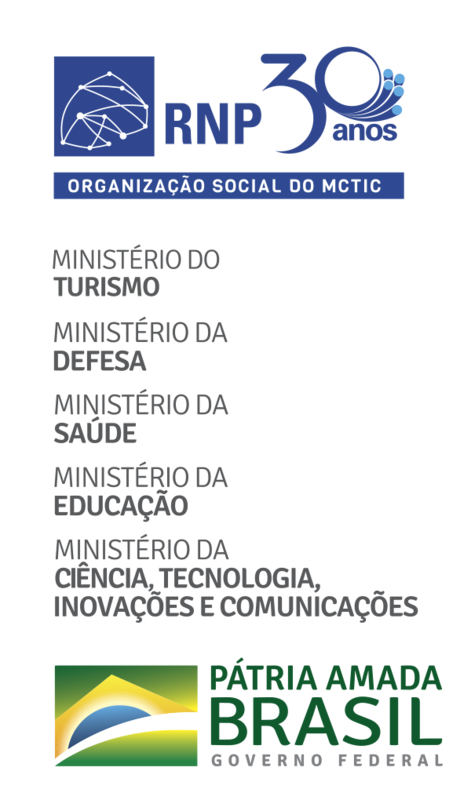 The latest coordinates the system by delegation of the Ministry of Science, Technology and Innovation (Ministério da Ciência, Tecnologia e Inovação - MCTI). In this service, the user may enjoy the features of submission and monitoring tasks in computational resources, as well as the input and output data management from these tasks. Gisela Science Gateway is a scientific applications portal of the Grid Initiatives for e-Science virtual Communities in Europe and Latin America (GISELA) project, which functions as an interface for a grid environment. Its main goal is to implement a grid infrastructure in Latin America, through a sustainability model based on the “National Grids Initiative” (NGIs). For this, the association with the Latin American Cooperation of Advanced Networks (Cooperação Latino-Americana de Redes Avançadas - RedCLARA), and the national education and research networks (redes nacionais de ensino e pesquisa - NRENs) were used, in addition to the collaboration with the European Grid Initiative (EGI). Atlases is a library of high-resolution images of pathology. It is intended for medical students and professionals. Web application for scheduling meetings, creating polls and performing simple research. Search service for cultural repositories and digital file protected by access control and rights management, containing two large repositories: the “De Roberto Digital Repository (De Roberto DR)” and the “Digital Repository of the Architectural and Archaeological Heritage in the Mediterranean Area (MED Repo)”. Type of access: free, through an additional registration. IDEM Federation Service, belonging to the Italian academic network (GARR), of remote collaboration, shares network applications and multimedia content. FileSender: web tool for sending large files by e-mail. TERENA Networking Conference: access to the TERENA Networking Conference portal. Portal of scientific applications in grid facing the medical and neuroscientific community. Portal of scientific applications in grid for scientists in the Mediterranean region. Type of access: free, through additional registration. INFN is an organization dedicated to the study of matter fundamental particles, leading theoretical and experimental searches in the nuclear, sub nuclear and astroparticle physics area. The service provides access to various applications in grid and some of its use cases for the Italian community. Hungarian video, communication and collaboration portal services. Portal for research and researches of educational videos in high definition. Currently, the SAML (Security Assertion Markup Language) protocol has established itself as an ad hoc standard for exchanging authentication and authorization information between identity and service providers. It is universally adopted by many academic identity federations. Among the SAML based technologies, the Shibboleth pack, developed under the Internet2 project, has been the most widely used. Therefore, this is the technology adopted for CAFe. A federation must specify what user attributes must be kept by the identity providers and supplied to service providers, if permitted by their privacy settings. For CAFe, the brEduPerson data schema meets this requirement. Follow the scripts elaborated by CAFe's support team, using the suggested applications that have support. Community Regional University of Chapecó (in portuguese, UNOChapeco). Regional University of Northwest Rio Grande do Sul State (in Portuguese, Unijuí). For further information, contact CAFe's support team at atendimento@cafe.rnp.br.